>10/100/1000Base-TX to 1000Base-FX IN-BAND Management Switch Media Converter Single mode SC up to 10Km (Dual Fiber / WDM Option) Please call for other Singlemode option up to 50Km. 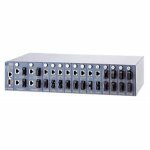 MC10-100-1000BTFCSM is fully compliant with IEEE802.3, 802.3u and 802.3ab standards. The installation & operation procedures of the MC10-100-1000BTFCSM are simple & straightforward. Diagnostic LEDs located in the front panel indicate the real time operating status. Moreover, if installed with the manageable MC10-100-1000BTFCSM / MC100-RACK-16, network administrator can remote monitor, diagnostic/loop back and configure the MC10-100-1000BTFCSM status via Console and standard SNMP manager.